If your adapter isn't listed below, it's an Original Equipment Manufacturer (OEM) or LAN on motherboard (LOM) adapter. We don't support OEM nor LOMs. See the Network Connection Support Policy for details on OEM network connection support and drivers. See computer manufacturer support websites for support information on OEMs. Identify your adapter PCI Device ID. Choose your operating system below and follow the instructions. 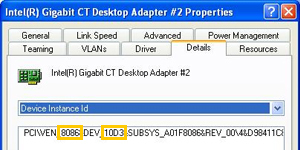 Expand Network adapters section and right-click the Intel® Network Adapter. Select Hardware ID from the pull-down menu. From Start, type devmgmt.msc. The search screen opens automatically when you begin typing. Click devmgmt in the results. Right-click the Intel® Network Adapter. Select Hardware IDs from the pull-down menu. Type "lspci -nn | grep -i 'Ethernet Controller'" at a command prompt. Locate your PCI device number in the tables below. Note PCI vendor ID 8086 identifies Intel as the manufacturer of the device. How do I identify my wired Intel® Ethernet Adapter and driver version?